There are little traces left of the period in between probably because architecture and sculpture in this time was not primarily made of stone and hence were perishable. Probably, since Gangetic area was moist, mud brick and wooden structures that were made during Mauryan period and before didn’t last. However, it cannot be said that there were not any stone buildings at all. 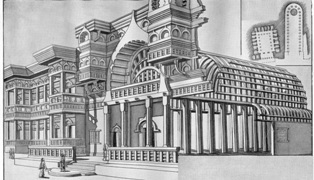 According to Magesthenese, capital Patliputra was as magnificent as capital of Iran and in architecture, Mauryan introduced use of stone for the first time. Chandragupta Maurya succeeded Nandas. Greek king Sikandar or Alexander had just departed India before Chandragupta ascended throne and Greeks became the first foreigner to invade India in 326 BCE. Writers who accompanied him left a vivid account of prosperity and social life during that times and arrival of Alexander in India is an important even which have helped in arranging historical records as well. The route that he followed was also used for cultural contacts as well. It is a well-known fact that the first three Mauryan emperors, Chandragupta, Bindusara and Asoka, maintained friendly relations with the Hellenic West and this led to some foreign influence on Mauryan art. Kharoshti script from Iran was also brought which was later used by Ashoka on inscriptions as well. It was written from right to left. Iranian influence on Mauryan sculpture was also significant. The lotus motifs used by Ashoka is borrowed from Persian architecture. From Iran, Greeks also came to know about the riches of India and Greeks under Alexander planned invasion of India at a time when Iran and Greece were vying for world supremacy. Greeks under Alexander also destroyed Iranian civilization. Achaemenid rulers of Persia had various areas under their control which were in close vicinity of Mauryan Empire. The Persian scribes brought into India a new style of writing called kharoshthi and it was used in many Mauryan inscriptions as well. Mauryan pillars were also influenced by Persian/Achaemenid art. The monolithic pillar edicts of Asoka with their bell-shaped capitals are somewhat like the victory pillars of the Achaemenid emperors which have been found in Persepolis. Most of Ashoka’s inscriptions were in Prakrit and were written in the Brahmi script and other local scipts like Kharoshthi. Most modern Indian scripts have developed from the Brahmi script over hundreds of years. Many pillars, capitals, rock cut caves and monumental figures were also constructed. The Yaksha image from Parkam and Yakshini image from Besnagar are examples of popular art, while pillars and capitols are examples of court art. Ashoka was greatly disturbed by the massacre of Kalinga war and he decided to relinquish violence and he instead went on path of ‘Dhamma Vijay’ or victory through Dhamma which combined in itself the good points of all sects and was essentially a moral code. ‘Dhamma’ is the Prakrit word for the Sanskrit term ‘Dharma’. Ashoka’s dhamma did not involve worship of a god, or performance of a sacrifice. He felt that just as a father tries to teach his children, he had a duty to instruct his subjects. He erected many capitols and edicts to propagate his Dhamma. In his 13th major Rock Edict, Asoka states that true conquest is by piety and virtue. In his 12th major Rock Edict, he states that in honoring of other sects lies the honor of one’s own sect. He saw himself as a father and the subjects as his children. He gave up the practices of the royal hunt and pleasure tours and instead began Dhamma Yattas tours for the furtherance of Dhamma. By giving his empire a common Dhamma, a common language, and practically one script (Brahmi) he brought further political unification. Ashoka felt it was his duty to solve the social problems. So, he appointed officials, known as the dhamma mahamatta who went from place to place teaching people about dhamma. Monolithic pillars and capitols made during this period are prime example of Mauryan art. The important places where the pillars have been found are Basarah-Bakhira, Lauriya-Nandangarh, Rampurva, Sankisa and Sarnath. These pillars were carved in two types of stone viz. the spotted red and white sandstone from the region of Mathura and buff-coloured fine grained hard sandstone usually with small black spots quarried in the Chunar near Varanasi.The uniformity of style in the pillar capitals suggests that they were all sculpted by craftsmen from the same region. Bull capitol of Rampurva, Lion Capitol of Lauriya-Nandangarh, and Sarnath Capitol, found near Varanasi, are famous examples. The best preserved of all Ashokan edicts stands at Lauriya Nandangarh (Bihar). This thirty-two feet tall column has an almost fifty ton seated lion capital placed on its top. Sarnath capitol, built in commemoration of the historical event of the first sermon or the Dhammachakrapravartana by the Buddha at Sarnath, is made from sandstone and has four lions, sitting on an abacus with four animals, inverted lotus as a base, a crowning wheel representing the Dhammachakrapravartana (which is now damaged) on a monolithic shaft. The four voluminous roaring lion figures firmly stand on a circular abacus which is carvedwith the figures of four animals proceeding clockwise around the drum, suggesting themovement of the wheel of dharma – a striding elephant, a galloping horse, awalking bull and a prancing lion. Four lions placed back-to-back face thecardinal directions, indicating the spread of dharma. The capital without the crowning wheel and the lotus base has been adopted as the National Emblem of Independent India. In sculptures, one of the finest examples of popular Mauryaart is the Yakshi figure from Didarganj, Patna and Yaksha image from Parkam are examples of popular art (Yakshas and Yakshis were part of both pre-Buddha and post Buddha religions and tradition and they also made a place in Buddhism and Jainism). Large statues of Yakshas and Yakhinis are also found at many other places like Vidisha and Mathura. These monumental images are mostly in the standing position. One of the distinguishing elements in all these images is their highlypolished surface. The depiction of faces is in full round with pronounced cheeks and physiognomic detail. It shows the popularity of Yaksha worship and how it became part of figure representation in Buddhist and Jaina religious monuments. A monumental rock-cut elephant at Dhauli in Orissa has also been found. In architecture, influence of Buddhism, Jainism, Hinduism, Yaksha worship and some sects like Ajivika can be seen. A rock cut cave – Lomus Rishi Cave carved at Barabar hills near Gaya in Bihar is another fine example of Mauryan art and architecture. The facade of the cave is decorated with the semicircular chaitya arch as the entrance.The cave was patronized by Ashoka for the Ajivika sect. Due to the popularity of Buddhism and Jainism, stupas and viharas were constructed on a large scale. However, there are also examples of a few Brahmanical gods in the sculptural representations. Stupas were constructed over the relics of the Buddha at Rajagraha, Vaishali, Kapilavastu, Allakappa, Ramagrama, Vethadipa, Pava, Kushinagar and Pippalvina. One of the best examples of the structure of a stupa in the third century BCE is at Bairat in Rajasthan. 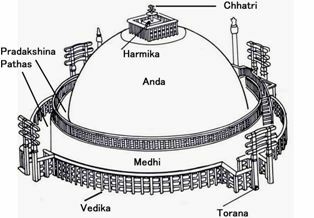 It is a very grand stupa having a circular mound with a circumambulatory path. Another stupa was made at Sanchi which is made of bricks. As Buddha is depicted symbolically through footprints, stupas, lotus throne, chakra, etc only during early phase of Buddhism, it is shown through these symbols only in Maurya architecture – for example Chakra in Ashokan pillars. It was only in later-Gupta period that narrative became a part of the Buddhist tradition. Thus events from the life of the Buddha, the Jataka stories, were depicted on the railings and torans of the stupas. The main events associated with the Buddha’s life which were frequently depicted were events related to the birth (lotus and bull), renunciation (horse), enlightenment (bodhi tree), dhammachakrapravartana (chakra), and mahaparinibbana or death (empty chair). Among the Jataka stories that are frequently depicted are Chhadanta Jataka, Vidurpundita Jataka, Ruru Jataka, Sibi Jataka, Vessantara Jataka and Shama Jataka. In Eastern India, burnt bricks were used for the first time during Mauryan period. Prohibition on rituals, sacrifices and absence of gifts made Brahmins averse to Dhamma of Ashoka. Ashokan Empire declined due to huge expenses on military, large gifts to Buddhists, heavy expenditure on building of Stupa, oppressive rule in provinces etc. Last Maurya ruler Brihadratha was killed in public by his Brahmin general Pushyamitra Sunga. Sungas tried to revive Brahminic order and even persecuted the Buddhists. the Satvahanas, Ikshavakus, Abhiras, Vakataks in southern and western India. Shakas, Kushans and Pratihars (were collectively called Yavanas) were foreigners, but later assimilated themselves into the Indian caste system as Kshatriyas as they were from warrior creeds. Such instances of mass level social monitory in caste system happened only during post-Mauryan period. The period of the second century BCE also marked the rise of the main Brahmanical sects such as the Vaishnavas and the Shaivas which also led to building of Hindu temples and sculptures as well apart from Buddhist art. Post Mauryan period is dominated by the rock-cut architecture. This period also witnessed painting forms which still survive. In early periods, Sunga in North and Satvahana in south contributed to post-Mauryan art. They embellished the stupas with features like stone railings. Some of the prominent examples of the finest sculpture of Post-Maurya period are found at Vidisha, Bharhut and Sanchi (Madhya Pradesh), Bodhgaya (Bihar), Jaggayyapeta (Andhra Pradesh), Mathura (UttarPradesh), Khandagiri-Udaigiri (Odisha), Bhaja near Pu`ne and Pavani near Nagpur (Maharashtra).It’s worth note that till the development of the Gandhara and Mathura art school, Buddha wasdepicted mainly as symbols.Year of Kanishka’s accession i.e. 78 CE also marks the beginning of the Saka era and Kushana art overshadowed Sunga art. In south India, Satvahanas emerged as strongest power in post-Mauryan period. After Satvahanas declined, many small kingdoms emerged in South and the first among them was that of the Vakatakas. Kalinga (present Odisha) also emerged important cultural place under king Kharvela. After the Vakatakas came the Chalukyas of Vatapi and Kalyani. The Chalukyas kept fighting with the Rashtrakutas (towards the north) and the Pallavas (towards the south). The Chalukya rule came to an end in 753 CE when the Rashtrakutas defeated them. Further down south, Cholas, Cheras and the Pandyas were always at war with each other. Bharhut is one of the prominent places of early Buddhist art, a stupa was build here around 100 BCE by Sunga rulers. Bharhut sculptures are tall like the images of Yaksha and Yakhshini in the Mauryan period. Though the stupa got damaged, it has one of the earliest surviving railings which are now preserved. Here, sculptures are carved out with features like – low relief, densely packed with objects, persons with folded hands as there was no scope of projections due to low relief etc.Figures ofyaksha-yakshinis along with natural settings were common themes apart from scenes from Jatak tales. Stories are depicted in terms of a narrative in form of multiple panels of sculpture. As relief was low, it was less refined style. ‘Queen Mahamaya’s dream’ is one of the most famous sculptures apart from scenes from Jatakas. The sculptural at Sanchi Stupa (and also at Mathura, in UP and Vengi in Andhra Pradesh) shows stylistic progression from Bahruta. There are actually three stupas here one of which is believed to have relics of Buddha. The stupa at Sanchi has upper as well as lower pradakshinapatha and four beautifully decorated toranas depicting various events from the life of the Buddha and the Jatakas. Upper Pradakshina path is something which is unique to this stupa. Originally, the stupa was a small brick structure which expanded over a period and was covered with stone, vedika and the torana (gateways) which are profusely decorated. The Ashokan lion capital pillar with an inscription is found on the southern side of the stupa, indicating how Sanchi became a centre of monastic and artistic activities. In comparison to Barhut, the relief of figures is high and they fill up int he entire space.Buddhas continues to be prominently depicted assymbols rather than in form of human figures. The narratives get more elaborated; however, the depiction of the Mahamaya dream episode remains very simple showing the reclining image of thequeen and the elephant at the top.There are also guardian images on pillars and the Shalbhanjika (lady holding tree branch). Sunga Art was followed by Kushan Art. During Kushan period, first gold coins were also introduced, art of which was borrowed from Greek. Gandhara art of Kushans has more foreign influence as compared to Mathura art. Kushana art distinctively showed emperor in divine form. The sculptural tradition in Gandhara had the confluence of Bactria, Parthia and the local Gandhara tradition. The local sculptural tradition at Mathura became so strong that the tradition spread to other parts of northern India. The best example in this regard is the stupa sculptures found at Sanghol in the Punjab. Apart from Mathura, a school also developed at Sarnath and Kosambi. This image of the Buddha from Sarnath belonging to the late 5th century CE i.e. from Gupta period. It has been made in Chunar sandstone. The Buddha is shown seated on a throne in the padmasana. It represents dhammachackrapravartana as can be seen from the figures on the throne. Many Buddha images in Sarnath have plain transparent cloth covering both shoulders (while in Mathura only left shoulder is covered), whereas the Mathura Buddha images continue to depict folds of the drapery in the Buddha images and the halo around the head is profusely decorated. The roundness of the cheeks has reduced as compared to the earlier images from the Kushana Period at Mathura. The hands are shown in dhammachakrapravartana mudra placed just below the chest. At Sarnath, there are also standing images of Buddha, but at Mathura and Gandhara predominantly only sitting Buddha is shown. In south, Vengi was important Buddhist center of scuplpture and architecture under Satvahan rulers in 200 BCE. Vengi in Andhra Pradesh has many stupa sites like Jagayyapetta, Amaravati, Bhattiprolu, Nagarjunkonda, Goli, etc. Amaravati was third important center of Buddhist art apart form Gandhar and Mathura during Kushan period. It had a mahachaitya and had many sculptures, out of which Amravati is one of the most important sites. Amravati stupa was started around 1st century BCE, but was finally completed in 1st century CE. Like the Sanchi Stupa, the Amaravati Stupa also has pradakshinapatha enclosed within a vedika on which many narrative sculptures are depicted. The domical stupa structure is covered with relief stupa sculptural slabs whichis a unique feature. There were toranas also built on the stupa, but they disintegrated with time. In this stupa also events from the life of the Buddha and the Jataka stories are depicted like Sanchi stupa. Like Sanchi, images of Buddha were also added in 3rd century CE. However, sculptures at Amravati are more complex and full of emotions unlike Sanchi which are simpler. Figures are slender, have a lot of movements, bodies are shown with three bents (i.e. in tribhanga posture). However, with the rise of Vajrayana Buddhism many Boddhisattva images like those of Avalokiteshvara, Padmapani, Vajrapani, Amitabha, and Maitreya etc were added as a part of the personified representations of certain virtues or qualities as propagated by the Buddhist religious principles for the welfare of the masses. Apart from stupas, Chaityas and Viharas were also made, but they didn’t survive over time. The front of the chaitya hall is dominated by the motif of a semi-circular chaitya arch with an open. In all the chaitya caves a stupa at the back is common. Later some modifications were made in 1st century AD to above designs. Karla chaitya hall is decorated with human and animal figures. They are heavy in their execution, and move in the picture space. Further elaboration over the Karla chaitya hall plan is observed at Kanheri Caves. The viharas are excavated in all the cave sites. The plan of the viharas consists of a veranda, a hall and cells around the walls of the hall. Some of the important vihara caves are Ajanta, Bedsa Cave, Nashik Cave etc. Many of the early vihara caves are carved with interior decorative motifs like chaitya arches and the vedica designs over the cell doors of the cave. Junnar, Maharashtra has the largest cave excavations – more than two hundred caves around the hills of the town – whereas Kanheri in Mumbai has some hundred caves. The Ajanta Cave,near Aurangabad, Maharashtra, India are 29 rock-cut cave – 25 Viharas and 4 Chaityas – monuments which date from the 2nd century BCE from Mauryan times,but primarily built during Gupta period and discovered only in 1829. Further, 5 belong to Hinyana period and rest belong to Mahayana period. Cave number 26 is especially elegant architecturally. It is very big and the entire interior hall is carved with a variety of Buddha images, the biggestone being the Mahaparinibbana image. All three primary art forms viz – architecture, sculpture and paintings – are associated with these caves. The caves include paintings and sculptures considered to be masterpieces of both Buddhist religious art (which depict the Jataka tales) as well as frescos (while making a fresco, first a layer of clay mixed with some rice husk and cow-dung is spread on rock wall, then a coating of lime plaster is done on which natural colors are painted and the wall is still kept wet while painting is made). Some of the famous frescos are – preaching Buddha, dying princess, flying apsaras. A bodhisattva holding a lotus is perhaps the most famous and the most well preserved of them all. Lines are clearly defined and are very rhythmic. Body color gets merged with the outer line creating the effect of volume. The figures are heavy like the sculptures of western India.Figures in these caves are painted with considerable naturalism and there is no over-decoration. Ajanta is only surviving example of paintings of 1st century BCE and 5th Century CE. Cave 26 has famous ‘Mar Vijay’ sculpture of Buddha which depicts the victory of Buddha over Mara (desire) figuratively in which army of Mara and his daughter is shown surrounding Buddha. The event is part of the enlightenment. It is a personification of the commotion of mind which the Buddha went through at the time of enlightenment. In this, a dialogue between the Buddha and Mara is shown,and the Buddha is shown with his right hand indicating towards earth (bhoomisparshamudra) as a witness to his generosity. This relief sculptural panel is highly animated and shows a very matured sculptural style at Ajanta. This is the largest sculptural panel at Ajanta. Since these caves belong to a long period, they also had multiple patrons and the artists of those time worked for different guilds and hence had different affiliation and style which is reflected in the stylistic differences in different caves. Among the important patrons at Ajanta were Varahadeva (patron of Cave No. 16), the prime minister of the Vakataka king, Harishena; Upendra gupta (patron of Cave Nos. 17–20) the local king of the region and feudatory of the Vakataka king, Harishena; Buddhabhadra (patron of Cave No. 26); and Mathuradasa (patron of Cave No. 4). Since 1983, the Ajanta Caves have been a UNESCO World Heritage Site. Ellora caves are another important example of cave architecture during post-Mauryan times located 30 km from the city of Aurangabad in the Indian state of Maharashtra largely built by the Rashtrakuta rulers, with significant contribution from Gupta rulers as well. They were built between the 5th century and 10th century. Ellora represents the epitome of Indian rock-cut architecture.The sculptures at Ellora are monumental, and have protruding volume that create deep recession in the picture space. These caves have a great cultural significance as they are unique in terms of existence of Hindu, Buddhists and Jainist caves at one single place. Buddhist caves also represent confluence of multiple Buddhist traditions like Vajrayana, Mahayana etc. It perhaps reflects the religious harmony that prevailed at that time as well. 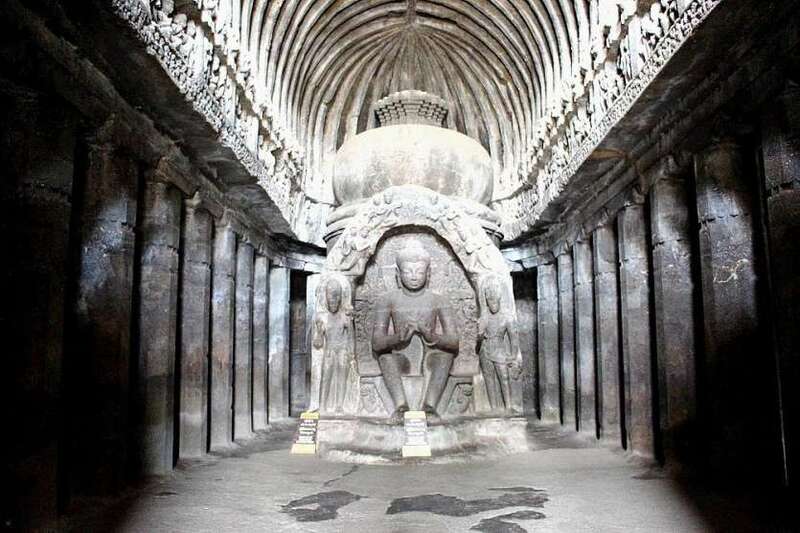 Architecturally also they are of supreme importance as they represent a confluence of multiple architectural tradition because various guilds which patronized various caves at Ellora came from different places like Vidarbha, Karnataka and Tamil Naduand carved the sculptures. Thereby it is the most diverse site in India in terms of the sculptural styles and there is a confluence of Nagara, Dravidian and other architectural styles. They are total 34 caves – 17 Hindu, 12 Buddhist, and 5 Jain caves, built in proximity. Among Hindu caves, both Vaishnavite and Sahivite puranic deities are found. Among the Shaivite themes, Ravana shaking Mount Kailash, Andhakasurvadha, Kalyanasundara are profusely depicted whereas among the Vaishnavite themes, the different avatars of Vishnu are depicted. Cave No. 16 is known as Kailash leni. A rock-cut temple has been carved out of a single rock, a unique achievement of the artisans. This Kailashnath temple is the most magnificent among these cave temples and was built by Rashtrakuta rulers. It has a Dravida architecture. One of the caves (cave no. 10) is also dedicated to Vishvakarma god – patron deity of craftsmen. Ravan ki Khai (cave no. 14), Dashavtara Cave (cave no. 15) are other caves. The Elephanta Caves are a network of sculpted caves located on Elephanta Island in Mumbai Harbor. It is contemporary with Ellora. The island, located on an arm of the Arabian Sea, consists of two groups of caves – the first is a large group of five Hindu caves, the second, a smaller group of two Buddhist caves. The Hindu caves contain rock cut stone sculptures, representing the Shaiva Hindu sect, dedicated to the god Shiva. It is said that caves were originally Buddhist, but were later dominated by Shaivite caves. Elephanta sculptures are known for the irremarkable qualities of surface smoothness, elongation and rhythmic movement. Their composition is very complex. Maheshmurti image of Shiva in which Shiva is shown as a three headed deity with heads of Shiva, Bhairava and Uma is epitome of this type of art. Ellora Caves are 100 km from Ajanta caves which have not only Buddhist, but also Hindu and Jaina caves. Ajanta Caves are on an almost perpendicular cliff, while Ellora caves are on a slopping hillock and hence Ajanta caves have no courtyards. A unique achievement of architect at Ellora caves is 3 story caves, while at Ajanta only one or two 2 story caves are there. All the caves at Ellora were plastered and painted but nothing visible is left, but caves at Ajanta have many murals which are still surviving. 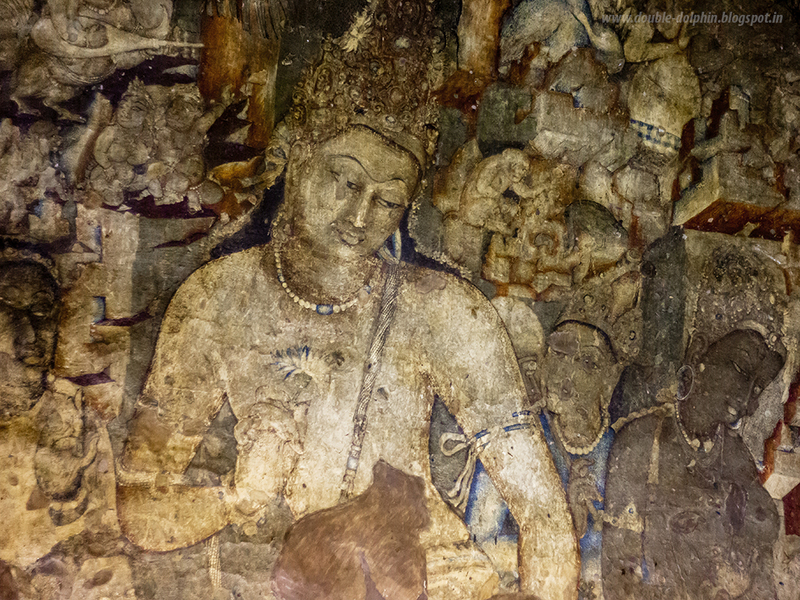 Buddhist caves at Ellora mostly belong to Mahayana sect, but Ajanta caves also have Hinyana art as they are older. Eastern India also witnessed contemporary growth of Buddhist architecture like Western India and mainly in the coastal region of Andhra Pradesh, and in Odisha from 2nd century BCE onwards. One of the main sites in Andhra Pradesh is Guntapalle in Eluru district. The caves have been excavated in the hills along with the structured monasteries. Perhaps it is among the very unique sites where the structured stupas, viharas and the caves are excavated at one place. The Guntapalle chaitya cave is circular with a stupa in the circular hall and a chaitya arch carved at the entrance. The cave is relatively small when compared to the caves in western India. Another important site is Anakapalli near Vishakhapatnam, where caves were excavated and a huge rock-cut stupa was carved out of the hillock during the 4th–5th centuries CE. It is a unique site as it has the biggest rock-cut stupas in the country. In Odisha, caves are found near Bhubneshwara called Udaigiri and Khanadagiri caves which are Jainist caves. Some of the important temple sites of this period are Deogarh in Uttar Pradesh, Eran, Nachna-Kuthara and Udaygiri near Vidisha in Madhya Pradesh. These temples are simple structures consisting of a veranda, a hall and a shrine at the rear. Ellora caves also have Hindu caves which were built around 5th century 10th century CE to and belonging to both Shaiv and Vaishnav traditions. Among the Shaivite themes, Ravana shaking Mount Kailash, Andhakasurvadha, Kalyanasundara are profusely depicted whereas among the Vaishnavite themes, the different avatars of Vishnu are depicted. Elephanta caves also had Shaivite caves which were believed to be Buddhist caves earlier. They are contemporary of Ellora caves and unlike them they don’t have any Vaishnavite caves. Udaigiri-Khandagiri caves in the vicinity of Bhubaneswar are scattered and have inscriptions of Kharavela kings. According to the inscriptions, the caves were meant for Jain monks. Later some of these were also dominated by Hindus. The tradition of rock-cut caves continued in the Deccan and they are found not only in Maharashtra but also in Karnataka, mainly at Badami and Aiholi, executed under the patronage of the Chalukyas; in Andhra Pradesh in the area of Vijayawada; and in Tamil Nadu, mainly at Mahabalipuram, under the patronage of the Pallavas. The post-sixth-century development of art history in the country depended more on political patronage than the collective public patronage of the early historic periods. The last phase of ancient Indian history starts in early 4th century CE and ends in about the 8th CE or from Gupta period (4th century to 6th century)to post Gupta period. It was during Gupta period that Brhminism made a shift to contemporary Hinduism and Buddhism declined. Vaishnavism became predominant religious trend and The Puranas were finally compiled in this age. The theory of Ten Avatars or incarnations (Dashavatara) of the supreme god Vishnu came to be accepted and among them, Krishna was considered the most important. Banaras and Prayag emerged as places of pilgrimage and idol worship became more popular. Prominent features of modern Hinduism took shape during the Gupta period. During the Gupta period the condition of women and Shudras improved as they were now allowed to study the holy texts and even worship a new God called Krishna, but number of untouchables increased especially Chandals and their social status was deteriorated. Gupta period is golden period of Indian art. Guptas were Hindu and Puranic Hinduism and its three deities – Shiva, Vishnu Shakti came to fore. However, Gupta were also tolerant towards others also. Buddhist art reached to its climax during Gupta period. The artistic achievement of the age is exhibited in the delicate workmanship and the variety of designs shown in different kinds of Gupta coins. The king is shown in many positions – shooting a tiger or a lion, playing a musical instrument seated on a high backed couch etc in these coins. Figures of Hindu god and goddesses were now profusely made which started with Buddha images during Kushan time. The Gupta period marks the beginning of the construction of free-standing Hindu temples. It was in Gupta period that buildings made up of lasting material were built.Examples of the Gupta art can be seen at the Dashavatara temple at Deogarh and the cave temples in Udaigiri hills. However, the most famous examples of Gupta art that still remain are the numerous seated and standing images of Buddha from Sarnath. Gupta artists were also skilled in bronze. A two meter high bronze image of Buddha has been discovered at Sultanganj (near Bhagalpur in Bihar). Painting as an art form reached a high degree of perfection during the Gupta times. The wall frescoes at the Ajanta caves (Aurangabad) and the one at Baghcaves (near Gwalior) bear evidence of this. Art was mainly religious. Exquisite sculptures of Buddha were made in Mathura and Sarnath. Ajanta paintings were also made primarily during Gupta period. Images of Vishnu and Shiva were made for the first time. Generally, the main deity was made larger than the other deities which also reflected the social distance that prevailed. In general, architecture of Guptas was not very advanced as we find very few brick and stone temples. However, Gupta period is remarkable for production of secular literature. Bhasa wrote 13 plays. Kalidasa also wrote many of the plays and Mahakavays. Abhijanshakuntalam was one of the earliest Indian works to be translated into European languages apart from Bhagvad gita. All the plays produced during the Gupta period were comedies, there was none of them which was a tragedy. Secondly, different people from different classes speak different languages. Woman and Shudras speak Prakrit. Commentaries on Sanskrit grammar were also written in this period. Amarkosha is a lexicon written by Amrasimha who was in the court of Chandragupta 2. Ornate style of Sanskrit was developed which was different from the simple Sanskrit of earlier period. Greater emphasis was on verse (poetry form) than prose. Religious literature was also galore during the Gupta period. Ramayana and Mahabhaarata were finally systematically compiled in 4th century AD. Puranas were also compiled in this period. Many smritis or law books were also written. In field of science and technology also advances were made. An inscription from Allahabad shows that decimal system was known during that period. In field of Astronomy, a book called Romaka Sidhanta was written which reflected Greek influence. Guptas also excelled in Iron and Bronze work with examples like bornze statue of Buddha in Diadarganj and Iron Pillar which was later brought to Allahbad. Developments in the field of religion, folk art and language in India during the medieval times have been important milestones in the evolution of the composite culture of India. New religions movements like Sufi and Sikhism along with Bhakti movement contributed to this process. The period also saw rise of Islam in India. During the period of Delhi Sultanate, mural painting has been reported from the royal palaces and royal bed-chambers and mosques. The early Turkish rulers which ruled India from 12th century (1200 CE) to 16th century (1526) were called Sultans, as they were supposed to rule on behalf of the Caliphs. During the Sultanate period, we notice the Persian and Arabic influences on Indian painting. They also made a beginning of Indo-Islamic architecture. Mughals his successors brought revolutionary changes to painting and sensual illustrations. From this period book illumination or individual miniatures replaced wall painting as the most vital form of art. Architecture also took many strides in form of tombs, forts and mausoleums. Afghan ruler Sher Shah made a small interregnum in Mughal period and he built some buildings also. He struck beautiful coins in gold, silver and copper which were imitated by the Mughal Kings and Indian Rupee, though was named earlier, took popular shape during his time. His administrative methods were also adopted by Mughals. He also built Sadak-e-Azam a 1500 kos long road from today’s Bangladesh to today’s Pakistan. During 14th – 15th centuries CE miniature painting emerged as a powerful movement in Gujarat and Rajasthan and spread to Central, North and Eastern India because of the patronage of rich Jain merchants. Mandu in MP, Jaunpur in Eastern Uttar Pradesh and Bengal in Eastern India were other great centers of manuscripts illustrated with paintings. Withdrawal of royal patronage to painting under Aurangzeb led to the dispersal of artists to different places in the country. This helped in the development of the art of painting in Rajasthan and the Punjab hills giving rise to distinct schools of paintings, for example, Rajasthani and Pahari Schools. After decline of Chola, Vijaynagara rose as a Hindu Kingdom in 14th century and Bahamani kingdom as an Islamic kingdom. The Bahamani and Vijayanagara kingdoms were pitted against each other over the rich Raichur Doab. Both contributed to art and architecture in their own ways. In the late 18th and early 19th centuries paintings comprised semi westernized local styles which were patronized by British residents and visitors. Shaikh Zia-ud-Din’s bird studies for Lady Impey and the portrait paintings of Ghulam Ali Khan for William Fraser and Colonel Skinner are the examples of some excellent paintings of this period. In the later nineteenth century art schools on the European model were established in major Indian cities like Calcutta, Bombay and Madras. Oil paintings of Raja Ravi Varma of Travancore depicting mythological and social themes became highly popular at this time. Rabindranath Tagore, Abanindranath Tagore, EB Havell and Ananda Kehtish Coomaraswamy played an important role in the emergence of the Bengal school of Art. The Bengal School had a great flowering at Shantiniketan where Rabindranath Tagore set up the Kala Bhavan. In architecture also, great strides were made during colonial times as they made huge buildings to demonstrate their might. Another significant development was the formation of the Progressive Artists Group in Art and Architecture Bombay in 1948 under Francis Newton Souza. The group also included S H Raza, MF Husain, KM Ara etc. This group broke away from Bengal School of Art and represented the modern forceful art of independent India. Two government institutions have been set up to promote art, music etc in India. The National Gallery of Modern Art has the largest collection of modern art under one roof. The second one is the Lalit Kala Akademi which recognizes and patronizes artists in all fields.